AT VASSAR TEMPLE, HUNGER ACTION IS A YEAR-ROUND, MEAL-BOUND COMMITMENT WE MAKE TO THE WIDER COMMUNITY. THIS FALL 2013, PLEASE ~~ JOIN US. WE HAVE A FULL LINE UP OF OPPORTUNITIES TO FEED OUR NEIGHBORS. A GREAT MENU OF FOOD DONATION, SERVICE AND FUNDRAISING ACTIVITIES TO CHOOSE FROM! 1. SUNDAY NOVEMBER 6TH, COME HELP PREPARE AND SERVE FOOD AT THE LUNCH BOX WITH OUR 6TH & 7th GRADERS AND THEIR FAMILIES. CAN’T MAKE IT BUT WANT TO HELP? WE ALSO HAVE A SPECIFIC MENU AND NEED CERTAIN FOOD ITEMS IN ADVANCE. FOR MORE INFORMATION, CAPTAIN IS CAROLYNN FRANKEL CAROLYNNFRANKEL@YAHOO.COM. 5. DECEMBER 1-31, 2013: SOUPER SALE! MAKE A DONATION TO THE TEMPLE EARMARKED FOR THE TEMPLE SOUPER SALE. CASES OF CHUNKY SOUPS WILL BE PURCHASED AND DELIVERED TO MULTIPLE COUNTY-WIDE PANTRIES TO DISTRIBUTE TO INDIVIDUALS AND FAMILIES NEEDING WARM WINTER MEALS. EARLY JANUARY, CONSIDER VOLUNTEERING TO TAKE ONE LOAD TO A PRE-ARRANGED DELIVERY SPOT. 6. CAN JAM 2013: YEAR-ROUND, OUR TEMPLE FOOD BIN IS IN THE FOYER READY TO TAKE ANY DONATION OF CANNED OR NON-PERISHABLE FOODS YOU CAN GIVE, ANY TIME DURING TEMPLE HOURS. EACH MONTH, THIS ‘MINI-LOAD’ IS DELIVERED TO A NEEDY PANTRY IN DUTCHESS COUNTY. CAN YOU VOLUNTEER TO DO A DELIVERY JUST ONCE THIS YEAR? CONTACT NANCY SAMSON AT CANJAM123@AOL.COM OR CALL 845.462.4828. THANK YOU VASSAR TEMPLE MEMBERS! This immediately follows the sacrifice of Isaac – that didn’t happen. Note that Midrash is part of Talmud. Also, the Hittites were generally associated with Asia Minor. Note that those “in the fold” are just the family itself. The first person to become a Jew by choice in the Torah is Ruth. All of Abraham’s household undergoes circumcision to join him in his monotheistic faith. 23:7 Ephron offers the burial cave for free in the presence of the community. This is more than a bargaining ploy. There is recognition of Abraham’s numbers and strength. They want to take him into their midst and make him an honorary Hittite. Also, the suggestion is that the property is non-arable and not valuable. 24:1 Abraham sends his slave to his homeland to find a wife for Isaac. “Do not bring my son back there.” Again, Abraham is intent that his son and his son’s family remain with him. The slave of course finds Rebekah in the house of Laban. This story of Abraham’s encounter with God takes place in Hebron right after the birth of Ishmael. Abraham is recovering from his circumcision. 18:1 The first and second sentence seem to be disconnected. We are told first that the Eternal appeared and then three strangers appear. We are to assume that they are a manifestation of God. God is present to visit Abraham, in part, because he is ill. This establishes the mitzvoth of visiting the sick. See footnote 3 – Maimonides understood the entire episode to have been a vision. 18:8 Note the ostensibly non-kosher presentation. A major question is presented: did Abraham have the Torah? Christians would argue not. But per rabbinic argument there is no before or after in the Torah.. He knew the law. Per Rashi the men pretended to eat out of courtesy. Alternatively, they may not be known by Abraham to be Jewish. Throughout the Middle Ages meat and milk could be on the table – just not mixed. They could be consumed sequentially. The practice changed toward the end of the Middle Ages. Note that there is a difference between a milk product and a meat product in terms of preparation. There must be much greater scrutiny of meat products than milk since with meat there must be ritual slaughter. Also, historically there has been a rejection in Judaism of the asceticism practiced by other faiths. Strict adherence to rules replaces asceticism. 18:9 Sarah laughs. This is the sole encounter between God and Sarah. Contrast the meeting between God and Hagar where God speaks directly to Hagar. 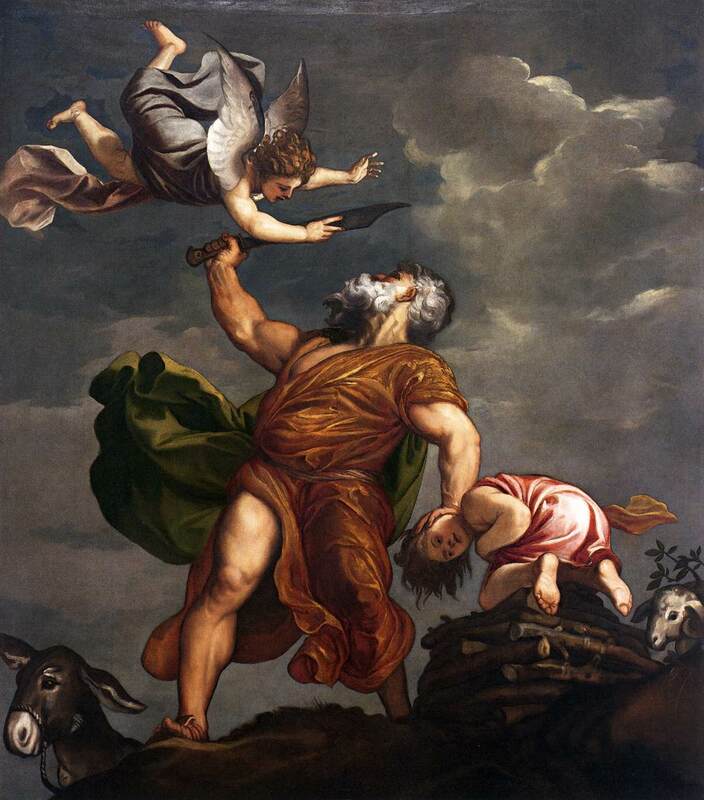 Abraham’s response to God’s statement that Sarah will have a child is ambiguous. He is happy that he already has a child. Sarah is actually challenging the notion of progress – in the sense that progress is defined as something new that alters the established order. Ishmael comes to represent Islam and Esau represents Christianity. Up until now we are not privy to God’s long term plans. This is the first expression of the covenant. 18:16 “Should I hide from Abraham what I am doing?” God appears to be ambivalent about how to proceed – and he talks to Himself. The Eternal tradition seems to convey a much more anthropomorphic image of God. This suggests that God wants to see what Abraham’s response to the plan will be. He asks a rhetorical question. We are engaged in a literary drama. Abraham is at a crossroads and a fateful decision will have to be made. Will Abraham’s nation be a righteous one? 18:20 -26 Will you sweep away the innocent along with the wicked? This is not merely a question of reward and punishment but justice. Talmud study is intended to be difficult. An active reader has to fill in the gaps. Abraham is probing the nature of justice – how is it to be determined. 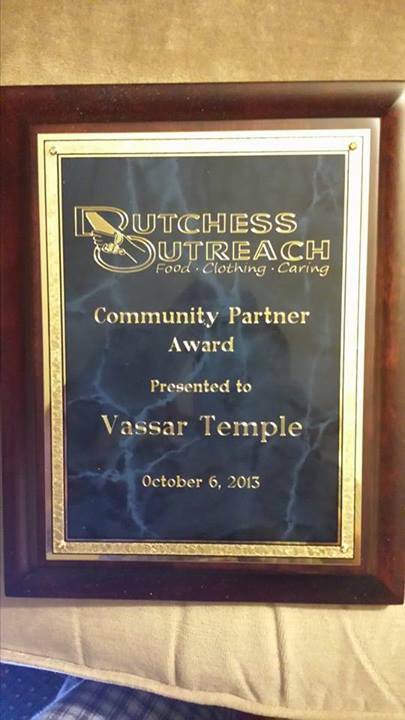 Anyone who has been around Vassar Temple knows that “Vassar Temple Cares About Hunger.” At their 7th Annual Brunch, held at the elegant Grandview, Dutchess Outreach recognized our congregation for our efforts with their Community Partner Award. Vassar Temple began providing monthly meals for our hungry neighbors 30 years ago, in a project spearheaded by Emily Himelstein, the first meals being prepared in Emily’s home and served at the Temple. The project was rapidly moved to St. Paul’s Episcopal Church and eventually to the “new” Family Partnership Center, where it still continues today under the aegis of Dutchess Outreach’s LunchBox. Our collection of nonperishable foods for food pantries including the pantry at Dutchess Outreach was transformed into the CanJam project by Nancy Samson, and now includes not only an ongoing food collection, but special seasonal food drives such as Trim-a-Thanksgiving, Turkey Trot, Souper Sale, Purim Pasta, Cereal Counts and Protein Plenty. Our Youth Group sponsors the yearly Yom Kippur Food Drive and all our rabbis over the years have led congregants in participating in the DCIC CROPWalk against Hunger. 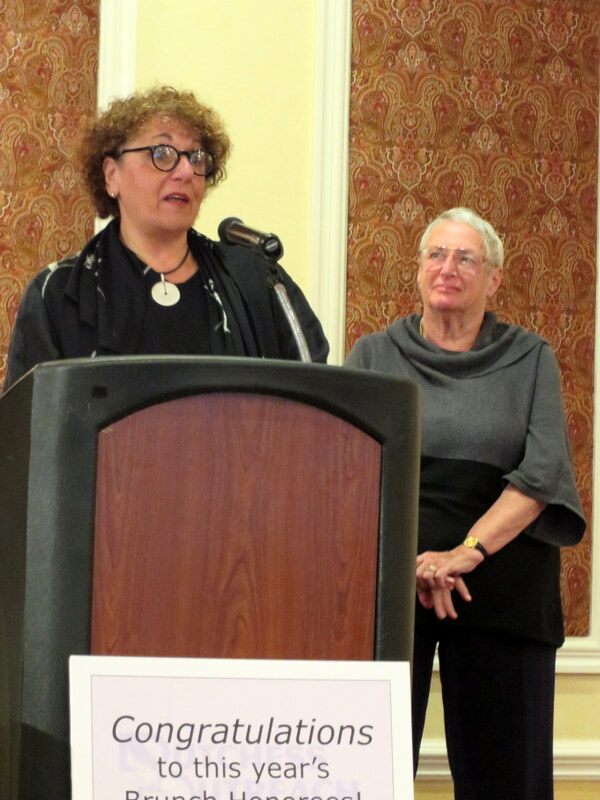 A dozen members of the congregation who are active in Temple social action efforts attended the brunch, and former LunchBox chairpersons Emily Himelstein and Jenny Krevolin accepted the award in behalf of the congregation. However, the award really honors each and every member of the congregation, without whom none of our projects could succeed. There are clearly two recognized creation accounts but some attempt to rationalize them into one consistent account. This is typically done by the ultra-orthodox. In assembling the Book of Genesis one wonders at the motivation of having two different versions of creation. What is being signaled? LL: Isn’t the story of Adam and Eve intended to explain the presence of evil in the world? CL: Literary scholarship at the beginning of the 20th C argued for the presence of two politically different tradition that were satisfied by the presence of both accounts. See: Albrecth Alt’s work: http://en.wikipedia.org/wiki/Albrecht_Alt. He wrote God of Our Fathers: A Contribution to the Prehistory of the Israelite Religion. PG: The inclusion of two creation accounts for political reasons would be a compromise unlikely to satisfy either side. The difference is in the image of God that is being presented. In the first account He is a creator; there is no indication that He will be present in the affairs of men. He is not a “hands on” God in that sense. Midrash would suggest that both accounts are acceptable as different ways of looking at the same thing. Consider the parable of the two cards: In one pocket the card says “I am the height of creation” and in the other pocket “even the lowly mosquito is before me.” LL: Perhaps this challenges our notion of what is a “book.” A book is not necessarily a continuous account from beginning to end. It can be in the nature of an assembly of “gleanings.” PG: That is true but there is something else going on here in terms of posing the question “where did everything come from?” This is the first time that this powerful religious and philosophical question is being explored via a single deity. Other religions before and at the time had multiple gods and the creation of the world was an accident. Here creation is purposeful and there is an assumption that the purpose will ultimately be revealed and fulfilled. The assertion here is that we as humans can have an impact on that outcome by our behavior. SF: We are in partnership with God – we have a place in the world and moral responsibility for it. PG: The second story creates the relationship with God. The sequence is a presentation first of transcendence and then of immanence. This takes us to the story of Noah. 6:9 There is a suggestion that this generation of the flood already knew Torah and the laws of Sinai. Note the use of the word “corrupt.” The Midrash makes the argument that the corruption was not technically a violation of the law; it was the accumulation of many minor sins. Note that virtually every ancient culture has a flood story. 6:17 The first appearance of the word “covenant.” Notice that Noah is silent and does not challenge God’s justice as does Abraham subsequently. 7: 1 Take seven pairs of every pure beast… Notice that the name of God has changed here to “the Eternal One.” The pure animals were for sacrifice as needed. This is very similar to the Gilgamesh epic from Babylonian culture. 7:10 A combination of ways that a flood can occur. CL: there is an association with a volcanic event from 1260 BC that could have caused a major flood in the eastern Mediterranean. PG: This is part of the search for biblical verisimilitude. In fact there have been major floods all over the world and it is very difficult to pin-point one. LL: But there was likely one in the eastern med that gave rise to this story. From the viewpoint of the writer/redactor this was their world. SF: We need to remember that they were between the Tigris and Euphrates river. Probably an area that flooded frequently. PG: Bibical verisimilitude is interesting but it does not tell us what this means or was intended. 7:13 “some of every species” here compares to the phrase “each true to its type” in the first story. Note that God closes the door – this is the immanent God who is present as distinguished from the transcendent. PG: There is still a group trying to justify all of this as true and have built a one-tenth replica of the ark for demonstration purposes.